The long darks of Moria were more lit than the last time Eirikr had been through. Even so, the paths seemed more dangerous. The lamps cleverly reflecting the light often allowed the enemy to find easy targets or disappeared from the trail without warning, destroyed or stolen. Eruviel and he often lent their bows to the protection of the caravan and progress was slow despite the Dwarven presence at the many holds along the way. 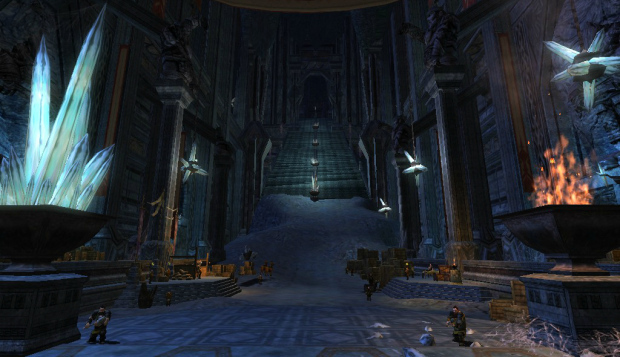 Between the Twenty First Hall and the Second, the paths were more often patrolled by goblin than Dwarf. On the fifth day, Eirikr had found himself grinning with satisfaction as each arrow he loosed hit true. Eruviel commented casually about his improved aim, but her eyes twinkled with her satisfaction. In his mind, Eirikr heard her unspoken words: I told you so, heruamin. Nonplussed, he smiled as he gazed across another gaping chasm impeding their way. A narrow, but passable, bridge had once extended across the dark expanse before him. Now, all that remained were jagged remnants of that bridge and Brogur informed them the Dwarves were forming a new path around the gigantic crack in the stone. More delays. They did not plague him as they once did, though. He knew every step, not matter how slow, was taking him closer to his goal. Right now, it was getting out of Moria. He was tired of the dark and reflected light. Tired of wondering if the next ambush would be orcs and goblins or something even more sinister. Tired of the echoes and tired of the feel of stone. Green. He wanted to see something green and growing. Nonetheless, as he stood at the broken bridge, he smiled. The sight inspired awe, as so much of the Dwarven architecture did and he kept his spirits up by admiring the work of hands from Ages go. Man in all his pompous grandeur could not hold a candle to the stonework of the Dwarves. The caravan began moving out; Eruviel rode up beside him leading his own mount. “Ready, heruamin?” she asked softly. They rode in comfortable silence with bows and arrows across their laps. The bridge had once joined the Second Hall with the First, but now a narrow footpath barely revealed itself along the edge of the chasm. Carefully, they picked their way around and finally found solid footing on the other side. Norlin directed his wagon beside them once the road widened. “Master Eirikr and Mistress Eruviel! Ye ready for the sun?” the portly Dwarf quipped. 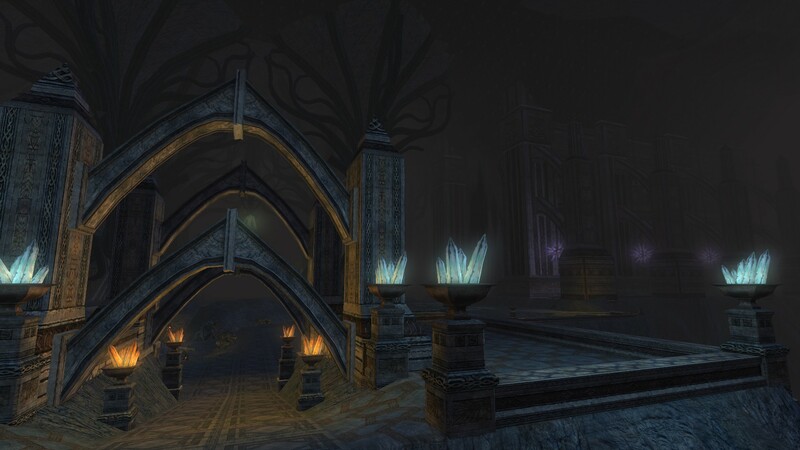 Eirikr turned from the columns to peer down the long passageway. As they drew closer, he began to make out the East doors out of the mountain guarded on either side by axe-wielding Dwarves. Slowly, with much clamouring, the caravan made its way out of the kingdom beneath the mountain. They left the rented goats with the Dwarves at the Eastern Stable and trailed after the last wagon, alert and ready. When finally they stepped over the threshold, Eirikr felt the cool air on his face and he breathed deeply. He looked up at the sky. It was indeed night, but Norlin had not misspoken. 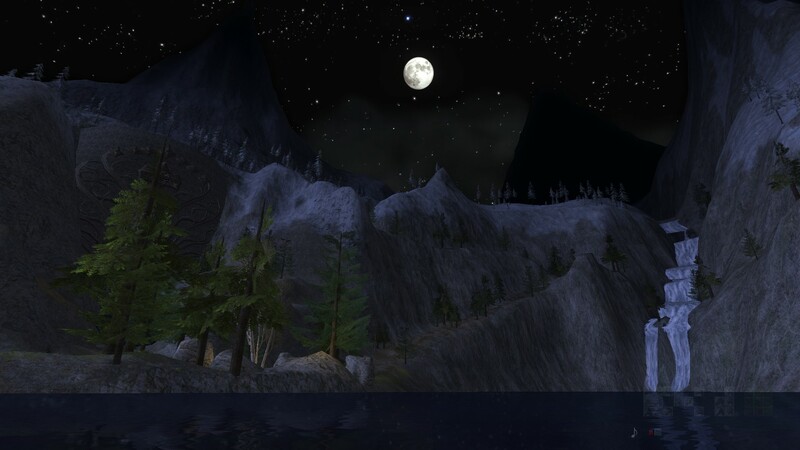 As Eirikr walked down the steps and approached the Dwarven camp established outside the doors, his breath was stolen by the sight of a million stars twinkling in the crystalline surface of the lake. Leaving Eruviel behind, he made his way through the Dwarves stirring at the arrival of visitors and found himself at the edge of land and water. He turned back and looked at the mountains. Celebdil loomed and the door soared. 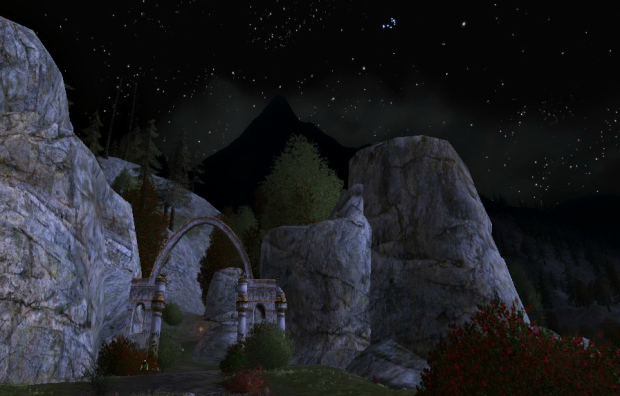 A full moon sank over toward the peaks and again, Eirikr smiled. 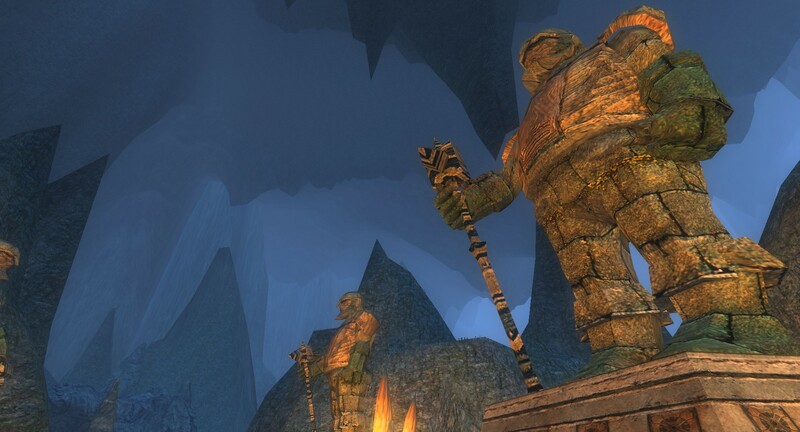 Goal: get out of Moria? Achieved. Eirikr stared at the stablemaster incredulously. Thalamb, an extremely stern-featured Elf with his light brown hair knotted carefully on the crown of his head, stared right back. Eirikr tried to surpress the indignant huff in his lungs. “There must be something we can do to win the trust of the Lord and Lady, yaaraaer,” Eruviel politely interjected. “The path between here and the Golden City is dangerous,” Thalamb answered cryptically. “What about the caravan? Why are they allowed in?” Eirikr asked. He ran a hand through his coppery hair and looked over his shoulder at the wagons and goats. He turned and quickly trotted after the caravan. Eruviel took the time to bow low before she backed away to follow him. He barely tried to suppress the snort and had an inkling the self-important Elf heard it. Nodding, he softly responded to her previous inquiry: “No, sister. I do not fear legends when what is before me is worse than any terrible tale spread by ignorance. But I am ready to shed light on the shadows and dispel the fear. Eruviel sat leaning back against the stone pillar, twirling the arrow between her thumb and pointer finger with the fletching whisking against the pant of her left knee. She had already counted the stalactites hanging from the vaulted ceiling as well as the sparks that had floated up from their now smoldering fire. Several merchants and travelers, still talked quietly a short ways away and she eavesdropped on their softly spoken conversations, wondering who best to join. The Hollin Gates closed behind them, the air reverberating from the thud echoing through the vaulted chamber. Eruviel had no intention of turning back, and though she knew it to be irrational she felt trapped in the dim light of Moria. The caravan moved further into Durin’s Threshold, and Eruviel pushed the ridiculous notion of claustrophobia out of her mind as she looked around the great space with a small, familiar smile. She had a number of positive memories of this place, and she chided herself for already failing to take her own advice. “Are we going to walk the whole way, or are we able to procure goats to carry us through?” said Eirikr, smirking as his question snapped her out of her thoughts. The provisioner, Thillosil, approached them holding a carefully wrapped bundle. Eruviel turned and accepted it with a smile and exchanged quiet words with her in Sindarin, shooting an occasional glance at Eirikr’s back. Though he could understand their words if he wished to do so, Eirikr did not bother with trying to listen. He could guess the thread of their conversation and he had little interest in addressing their concerns. Eirikr grunted. He knew she spoke truth. Eruviel smiled; only the curve of her cheek shifted enough to reveal the change of expression. Eirikr felt her amusement more than he saw it as he turned to look at her. Any irritation he felt at the time lost dissolved around him and he found himself chuckling as he ran a hand through his hair. Setbacks. Delays. He knew the obstacles served their purposes—he needed that sleep if he was honest with himself—but he longed to see the end of their journey. They mounted their borrowed steeds and set off. Sticking to the paths, they covered ground quickly, their horses’ hooves thundering through the wild lands as they passed beneath the ancient trees. As the holly and oak fell away, so did the path and Eirikr relied on Eruviel to navigate ever south through the dry river beds cutting across the land. Their passage startled more than one wild creature. As a lynx darted out of a shallow gully, his thoughts flashed to Anya and he wondered briefly how his sister fared back in Bree. South of Echad Eregion, they found the road again though it often faded into a worn footpath. At the edge of a river long dried up, the stone road branched east and west. 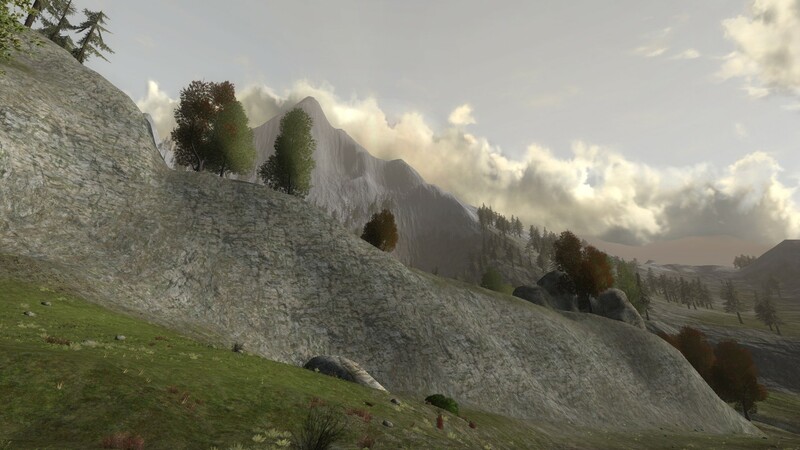 They took the eastern road and Eirikr could no longer ignore the towering mountains in the distance. As they grew, a darkness in his heart struggled to resurface. He thought of the poison left to the wilds near Thorenhad. He saw his father’s face. He recalled the dark gloom of the paths through the mountain. Steeling himself, he looked up at the mountain as the sun sank behind him. He knew the goblins and twisted passageways were not the worst things that stood in his way.